Low-quality grow tents that invite mildew-growth, leak light, and are easily punctured must be avoided. 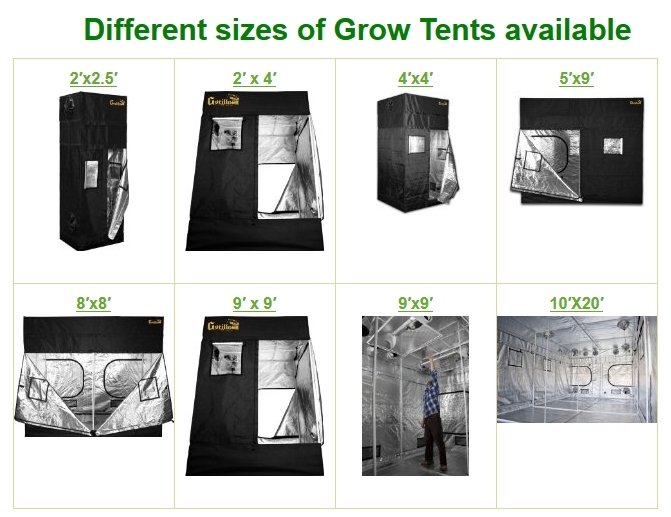 Top 10 Features of Best Grow Tents Revealed by http://HydroGardeningTips.com/. Hydroponic farming can be carried out either in an open system where plants are exposed to natural sunlight or inside a closed system where plants grow inside a grow tent. In case of the latter, artificial lighting has to be provided for successful plant growth. Because the tent is an important component of any successful hydroponics/indoor farm, every effort must be made to select the best possible tent. The TOP 10 Features of BEST Grow Tents describes all the specs one should pay attention to when selecting a grow tent. This is a recommended read for anybody that wants to avoid low-quality hydroponics tents. Not all grow tents are resistant to punctures, mildew, and fire. Among the 10 qualities one should look for in a grow tent, the resistance of the canvas to punctures, fire and mildew deserves special note. All kinds of farming generally involves use of sharp gardening tools. It’s only a matter of time before one of these sharp tools accidentally jabs against the tent cloth. The canvas should be kept puncture-free because even the smallest of holes will let light, moisture, heat and even bugs in/out. This is why puncture-resistance is an important feature to have in indoor-farming tents. Different brands of tents are made of canvases of different thicknesses/thread densities. For example, Gorilla grow tents are made of 1680D thread density-canvas while others are made with canvases of 200D to 900D thread densities. Excessive moisture favors the growth of most mold and mildew. Both with soil-based indoor farming and water-based hydroponics, there’s plenty of moisture/humidity involved. This moisture provides the ideal breeding grounds for plant killing mildew that can grow on both plants as well as on the inner surface of the tent. This is why it is important for the grow tent to be made of mildew-resistant material. 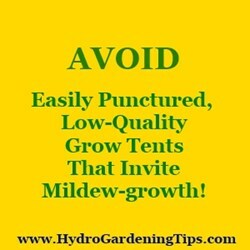 http://HydroGardeningTips.com/Best-Grow-Tents-10-Features/ also emphasizes the importance of fire-resistance. Grow lights, especially high pressure sodium or metal halide bulbs, produce a significant amount of heat. A malfunction of the grow light hanging apparatus resulting in the hot bulbs coming into contact with the tent cloth poses a definite fire hazard. This is why the best-quality grow tents are made of fire-resistant material. In addition to discussing the Top 10 features of high-quality plant growing tents in detail, they have also provided detailed reviews on the best grow tents in today’s market. They have reviewed the best brands such as Gorilla, Lighthouse Hydro, Milliard, Earth Worth, LED wholesalers etc. Modern technology has made these hydroponics grow tents very efficient on many aspects. For example a type of polyester known as BoPET (Biaxially-oriented polyethylene terephthalate), commonly known as Mylar reflective film, is used to line the interior surface of the grow tent. BoPET is known to reflect as much as 99% of the light that hits its surface. This is a very useful feature for hydroponics farmers. Generally, grow lights are hung at the top of the tent. Especially when there is thick leafy growth at the top, the leaves on the lower levels don’t get enough light. However, highly reflective interior linings made of Mylar are able to reflect nearly all of the light that falls on it, directing light in all directions and maximizing the chance of bottom layers getting sufficient amounts of light. It is important for any amateur or experienced hydroponics/indoor farmer to be aware of these basic principles in order to reap maximum yields from their efforts. In addition to reviewing the better grow tents available in the market, they also compare and review many grow lights and hydroponic systems. 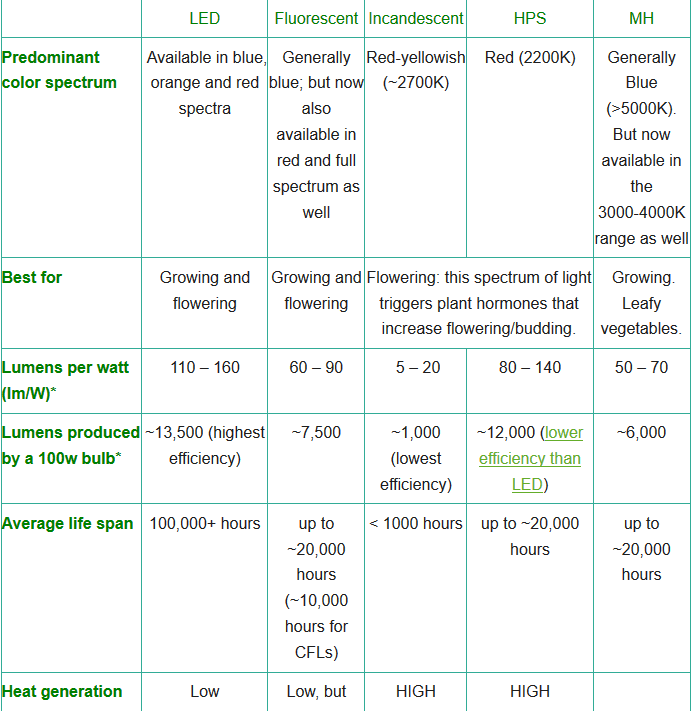 Their unique comparisons on various brands of LED grow lights, high pressure sodium grow lights, and fluorescent lamps are valuable reads for any current or future indoor farmer.